Belvoir Rd. at Plymouth Rd. in Plymouth Meeting, courtesy Scott Colbert. Plymouth Rd. EB leads to the Norristown exit (333) on I-276. Clearly these are both original signs. 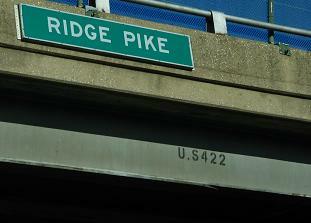 Scott Colbert caught the U.S. 422 stenciled on this overpass. 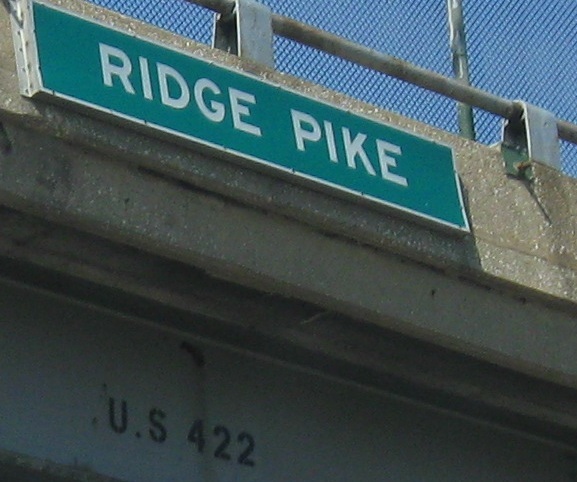 Ridge Pike was US 422 until 1966, which is after the Turnpike was extended through here to New Jersey. 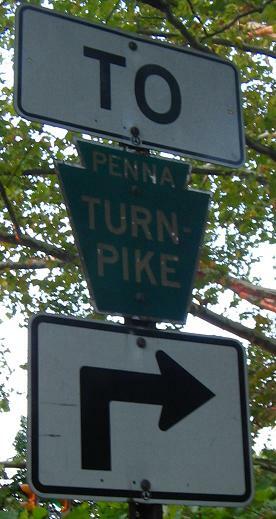 422 continued to enter Philly until 1985 via the Germantown Pike instead. 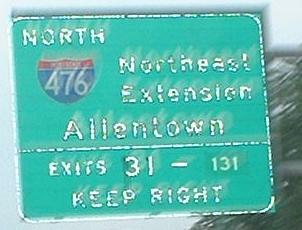 The NE extension was PA 9 until the Blue Route, the southeastern I-476 bypass of Philadelphia, was complete to the PA Turnpike. This, I believe, is the last toll highway to have been renumbered to an Interstate highway. 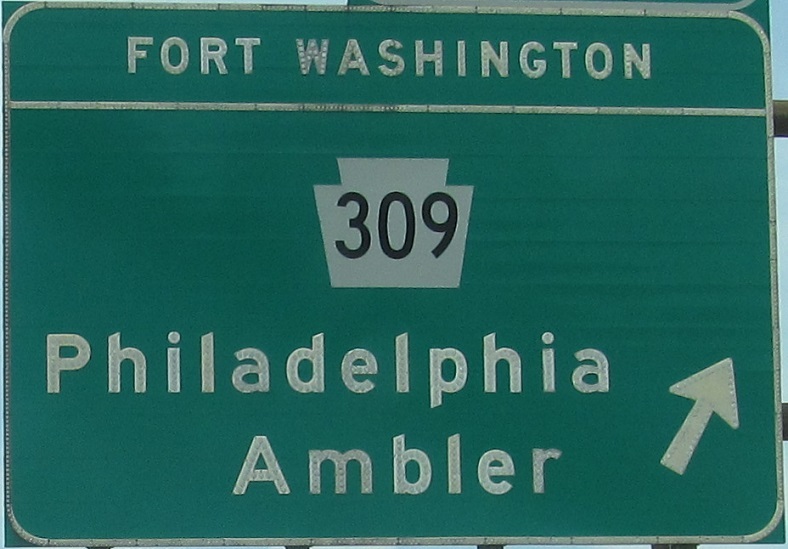 PA 309, which runs right near the Extension for most of its length, is actually former US 309 and not related to PA 9, though it may have influenced the latter's numbering. 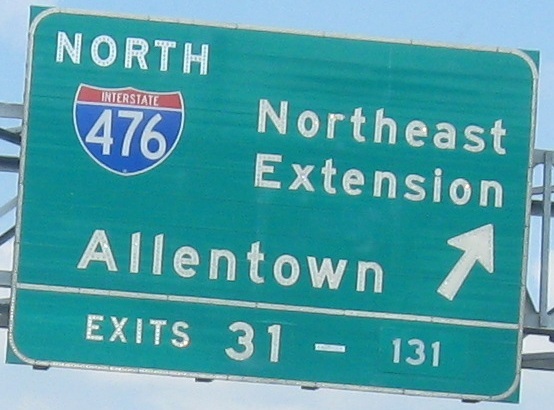 At the switch to mile-based exit numbers, everything changed except Exit 31 - I-276's easternmost exit was 30, and the first one on the Extension is coincidentally at I-476 mile 31. The movement between I-276 (either direction) and I-476 NB isn't numbered because it's all part of the same ticketing system. Exit 334 would certainly work here, but it might confuse drivers looking frantically for the proper amount on their tickets (instead of looking at that car slowing down five feet in front of them). Notice the patches for exit numbers that contrast with the old button copy. 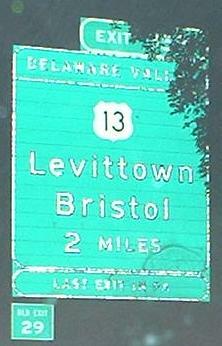 PA renumbered its highways from sequential to mileage-based exits; one old exit number is visible in the bottom photo. 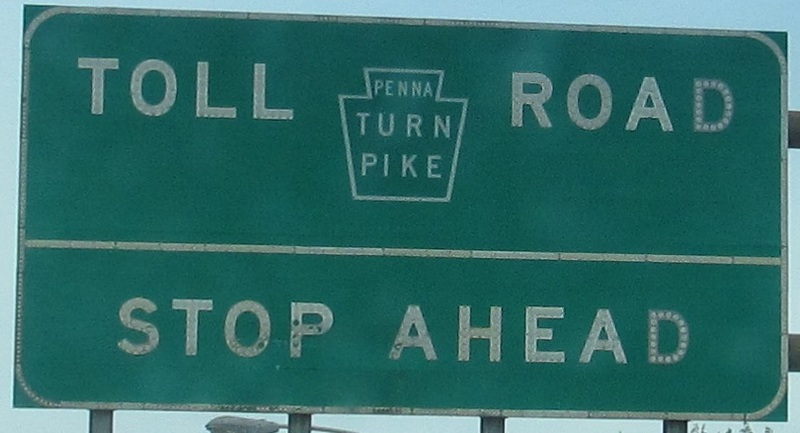 Through a miracle, mile 31 on I-476 corresponds to the old Exit 31 on the Turnpike Extension (30 was the easternmost exit on I-276). A new exit was under construction in 2010, now open as Exit 352 for Street Road (PA 132). But why bother? It's really not that hard to get out at Exit 351, go south just one measly exit on US 1 (just over the Turnpike), and then onto Street Road/PA 132. Only 1,800 vehicles a day use this exit - in theory, the ramp could handle that much PER HOUR. Why the waste of $8 million? One word: casino. I can't see how 1,800 vehicles would tip the balance at US 1 to require a direct exit a few hundred feet away, but politicians tend to act irrationally near large sources of money. The sign photo is courtesy Mike Byrnes. 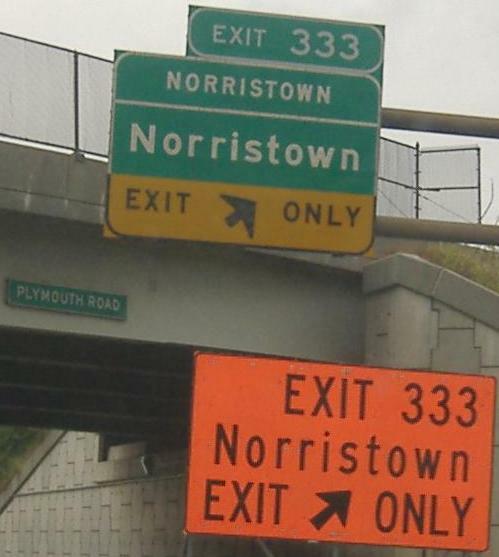 The LAST EXIT IN PA, Exit 358, and now Exit 42 on I-95 thanks to completion of the direct connection between I-276 and I-95. 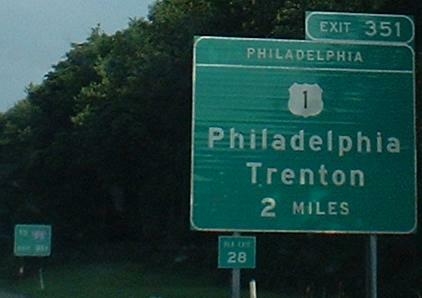 Click to drive into NJ, where I-276 once magically turned into I-95. 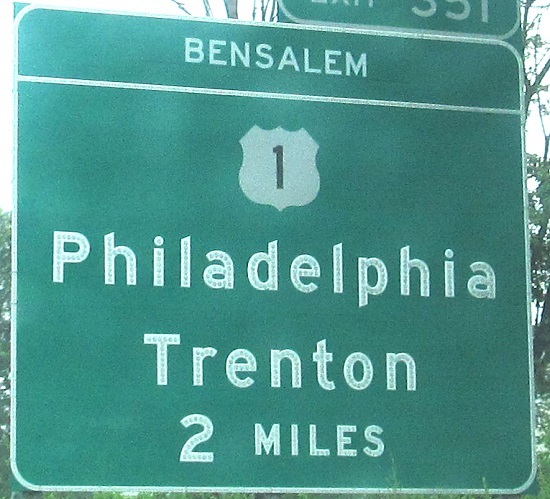 NJ just jumped the gun a bit on its numbering, for, say, 30 years or so, until PA caught up with its new interchange. This means that for many miles, there were two parallel I-95's, though you couldn't easily reach one from the other. Well gee, we just came off a toll road, no surprises. It would be nice if the PA and NJ Turnpikes could get together and take your ticket plus give you a new one in one fell swoop. This is the only E-ZPass exclusive exit on the I-276 section of the PA Turnpike, and only serves the WB side. 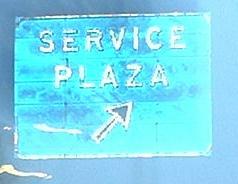 The white interchange name on the Exit 339 advance is also unique, as it's usually done in the standard white-on-green (and is usually button copy because most signs have not been replaced in several years). 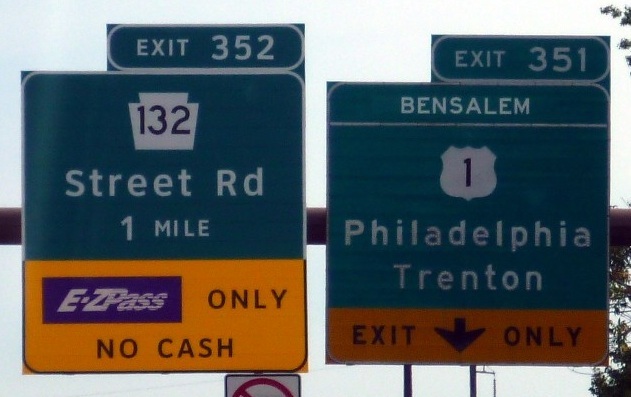 It is very obvious on that last sign that the I-476 shield on the right does not belong; clearly it was patched over a PA 9. You'd think the state-name shield didn't belong in the second photo, but I'd rather all of the other ones be replaced. 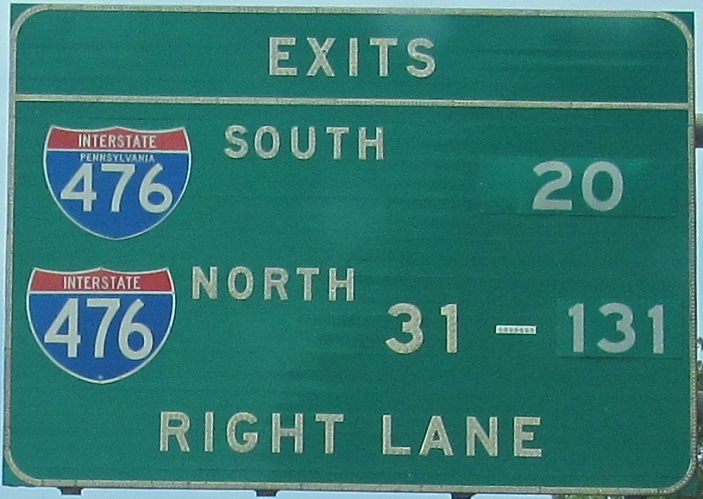 Exit Only became This Lane when the third lane on I-276 was continued west through the interchange. 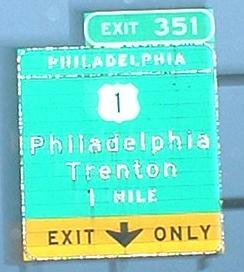 Even years later, yup, one exit skipped out on the renumbering. Well, no. That's I-476's exit number there, referring to the tollbooth at which I-476 transitions from Pennsylvania Turnpike Northeast Extension to Blue Route. 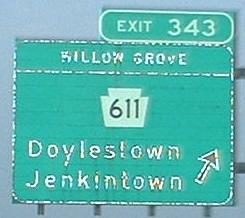 Because it's a mainline tollbooth, the exit number follows I-476 mileage, but then it's signed out of sequence on I-276. 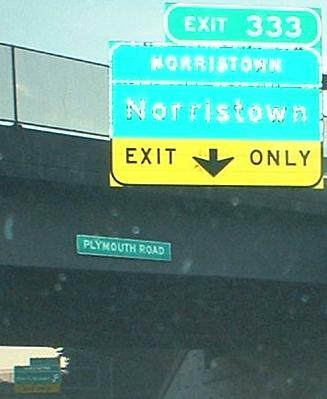 There is no EB connection to I-476 SB, as you may have noticed above; that's what the redundant Norristown exit is for (the junction name and BGS destination being the same). 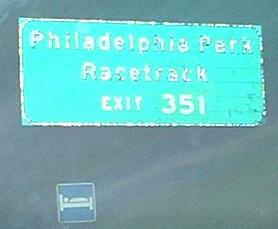 Notice the white border around "Exit Only" (should be black) and the unnecessary addition of Philadelphia - any reasonable traffic has used one of the last four exits to get there instead. 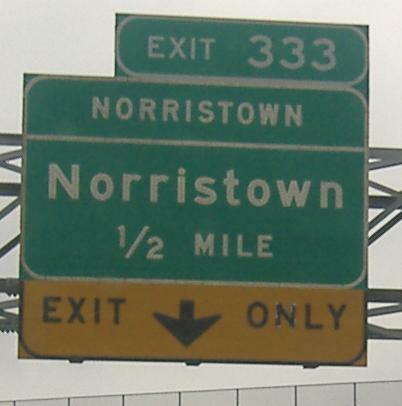 Gee, honey, should we take the Norristown exit to Norristown? 2006 construction appears to have replaced the sign way in back of the third photo, and then rotated the EXIT ONLY arrow (is that possible?) to create the sign in the second photo (which is otherwise unchanged). I'm guessing the orange sign was up while they were rotating that arrow (rotation's an awesome theory, I think), because it doesn't need to be there now. Just like on the EB side, this stencil has never worn away, protected from the elements by the overhanging parapet. Interesting, everything on that gantry was replaced... 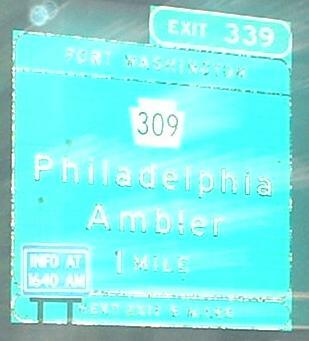 EXCEPT the top half of the sign on the right and the VALLEY FORGE interchange name. Even the shields on the top half were replaced, and not very well. 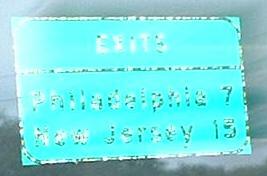 Why bother signing I-476 here? Who in their right mind would have blithely passed the I-476 MID-COUNTY interchange, and yet suddenly decides that they just MUST travel that route? Don't give me the excuse anyone was getting on at Norristown (the ONLY exit between I-476 and I-76 on I-276), because the 476 entrance is right by there as well. Chris Commans says this happened in the brief interval when I-476 (Blue Route) was completed but before the Turnpike interchange was reconstructed to tie it into then-PA 9 (Northeast Extension). So, then, it should have been patched over or removed long ago.